Since United fans dey shout say dem want make Jose Mourinho’s men play the Fergie Way.. Well, if you reason the way tonight’s match take end, as Manchester United knack Watford 4-2, i fit reason say na the Fergie way. 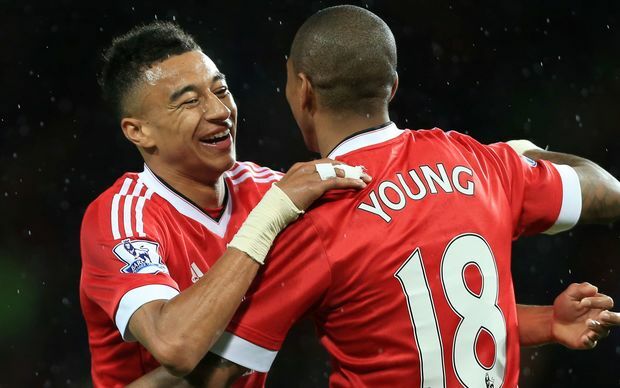 The people wey score for the Reds na Ashley Young (2), Anthony Martial (1) and Jesse Lingard (1). Right now, the Red Devils dey five points behind Manchester City, wey dey play against Southampton on Wednesday night. The first thing wey we observe na say Manchester United bin dey very clinical for first half as dem score most of the chances wey dem see. But dem dey wasteful for second half, Paul Pogba bin miss free header, and Lukaku just dey miss chances up and down like Elephant wey never chop for one week. We just dey pray make Lukaku get hin scoring sense back, because we dey play Arsenal and City very soon. The second thing wey we observe na say Ashley Young and Jesse Lingard bin dey on fire tonight. The fact say Young score two goals shock me self but the goals wey e score, make mad brain. As for Lingard, the goal wey e score, dey very important as e epp United secure three points. E no go surprise me if Lingard dey watch Lionel Messi tapes because na e score like am. Anthony Martial self try for first half as e also epp for attack. Another thing wey we observe na say Watford bin worry Manchester United no be small. Na dem get possession pass for the game self (59%-41%). The thing wey the Red Devils use kill Watford tonight na counter attack. Another thing wey we observe na say Manchester United bin try for defence but Marcos Rojo’s error (The penarity wey e dash dem) bin bring Watford back into the game. As dem score am, dey con dey pressure United more. See ehn, as the match con become 3-2, me i think say e don be as i dey reason say dem fit equalize. We just dey thank God for Lingard. If no be for hin goal, we for suffer for the rest of the game. Na hin goal kill their moral. The last thing wey we observe na say Romelu Lukaku don dey mess up in front of goal. For first half, E bin dey in the build-up for Young’s first goal. Also, e bin try with hin link up play, as e do assist for Anthony Martial’s goal. But for second half, e mess up. The one wey pain me pass na the ball wey Rashford give am, empty net. Baba dey count leg like say e dey wait to collect change from gala seller.